To see if colored eggs might actually go further back in history, she and her colleagues started by looking at the eggs of oviraptors-- a relative of the velociraptor made famous in the movie Jurassic Park. "This dinosaur is particularly interesting because oviraptors are the first dinosaurs that built open nests," she says, explaining that earlier dinosaurs buried eggs underground, where color wouldn't be expected to make any difference. "Once you start to build an open nest, your eggs are exposed to the environment," she notes. Out there, colors and patterns could provide camouflage or help dinosaurs recognize their own eggs. Inside some 66-million-year-old oviraptor egg fossils, her team found small concentrations of both pigments that color modern bird eggs. That was intriguing. Still, it was just one dinosaur. Now the researchers have analyzed egg shells from more. "We tried to cover the major branches of dinosaurs to get a good idea for all non-avian dinosaurs," she says. The red-brown and blue-green pigments were present, however, in eggshells from the group of dinosaurs that includes birds and their close relatives. 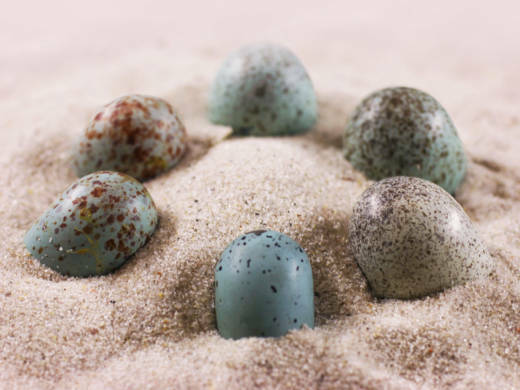 These pigments were built into the shells in the same sophisticated way that they are in modern birds' eggs--and Wiemann thinks this can't be a coincidence. "We have, very likely, a single evolutionary origin of egg color," she says. What's more, the analysis of pigments showed that dinosaur eggs even had spots and speckles. And that surprised Mark Hauber, an ornithologist and expert on eggs at the University of Illinois, Urbana-Champaign. "We not only know now that dinosaur eggs were colorful, but they were speckled, which is a whole other aspect of diversity," says Hauber. Dinosaurs may have needed these fancy eggs for all the same reasons as birds, suggesting that their behavior could have been just as complex. "Dinosaur eggs could have been camouflaged, they could have been individually recognized, they could have been mimetic," says Hauber. "So there are all the functions that are associated with spotting patterns on eggs that we did not even consider for dinosaur eggs." Plus, says Hauber, maybe distinctive colors and markings were linked to some egg-related dinosaur business we haven't even thought of. A certain egg color might have warned would-be predators of danger, he says, "and that could be that the mama dinosaur comes back, or papa dinosaur comes back, and will beat you up."